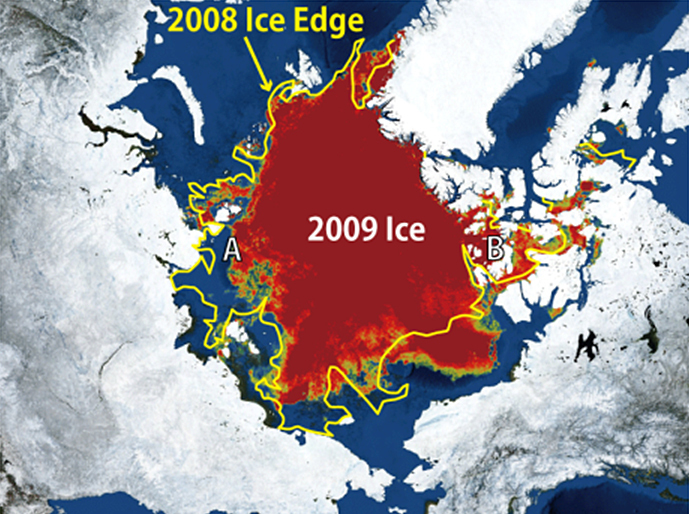 Global Ice Center Begins Weekly Arctic Ice Reports This Year Continues Ice Reduction Trend ～ Renewed Possibility of NW/NE Passages Opening from Last Year ～ – Weathernews Inc. The Global Ice Center at Weathernews, Inc. is pleased to announce the renewed possibility of both Northwestern (via Canada) and Northeastern (via Russia) routes opening through the arctic region this year, after confirming the yearly trend of the receding ice continued from last year. As of August, 2008, the ice extent in the arctic has continued to recede when compared with ice coverage from the same time period over last year. This can be explained due to a significant reduction in multi year ice as a result of an excessive melting over the last two years. As we proceed through the peak of summer, ice coverage is once again returning to this record low. The melting is mainly on the Northeastern route, and the sea ice extent remaining around the Taymyr Penninsula （Figure A） is clearly less than last year. However, on the Northwestern route, the Canadian artic region （Figure B） is widely covered with fast ice and not melting as quickly as last summer. This is due to the influence of higher temperatures than along the Northeastern route, and lower temperatures along the Northwestern route last spring. In the current transition, we believe the Northern routes will open sufficiently if ice continues to melt at this pace. The Northeastern opening for only a short time last year, but may open earlier and longer this year. Also, 2009 marks an El Nino year, in which statistical analysis shows warmer temperatures on the Northwestern route. So there seems to be a possibility of an opening on this side as well. However, when looking at the degree of recession and subsequent opening of the route, the state of the atmosphere and ocean will change, so regular monitoring of ice movements is essential. In response to this need, Weathernews’ Global Ice Center will publish weekly reports containing the latest information and observations of the summer ice levels through a dedicated website. Starting today, our Global Ice Center will start publishing weekly reports with the latest information on the ice recession trends along the NW/NE arctic passages. The report will be published through the official Global Ice Center website when the site is updated every Friday. The Global Ice Center regularly makes observation, monitoring, analysis and prediction of global ice conditions influenced by global warming, along with real-time monitoring of melting sea ice. Starting with the North Pole, we use this information to support safe shipping operations for freight forwarders worldwide. From a general outlook on ice conditions to ice extent predictions using our proprietary models, the report is for a wide range of specialists and generalists, as well. Displays graphs including the last few years of data on ice extent. Graphs features various data on both the Northeastern and Northwestern routes, along with changes and comparisons of the minimum and maximum ice extent each year. Various specialized ice conditions on NW/NE arctic routes are clearly displayed. Because the information is highly detailed, captains making coastal voyages through the arctic can use it to help make informed sailing decisions to help ensure safe and timely passage. Using Weathernews’ in-house developed I-SEE-Model, changes in ice coverage are forecast up to two-weeks in the future are shown. Our Global Ice Center will continue to monitor how ice changes from this point through this weekly report. This create the base for an even more realistic picture will be drawn together with the progressive realization of the first Polar Routeing service supporting Ship Masters on voyages through the arctic.